As part of the Department of Communication Arts’ #ReinventCommunication campaign, multimedia journalism program organizes workshop with Al-Fanar Media. Al-Fanar senior writer Benjamin Plackett gave participants a list of useful tips for interviewing researchers. 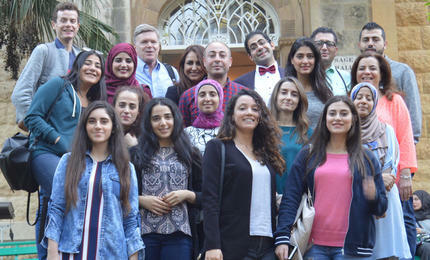 One group of participants in the workshop who included journalists and researchers from the MENA region, in addition to a number of LAU students and staff. When it comes to finding topics to cover in the news, there is a rich pool of stories today’s aspiring journalists can shine a light on. This is why researchers and students attended a workshop on November 14 focused on the coverage of research and education in the Arab world. The two-day event was the result of collaboration between Al-Fanar Media and LAU’s Department of Communication Arts as part of the department’s drive to develop its curricula and include more specialized courses in the Multimedia Journalism program. The workshop was the first collaboration between an Arab university and UK-based Al-Fanar, itself a project of the Alexandria Trust, a nonprofit organization that seeks to advance educational access and quality in the Arab world. Participants included journalists and researchers from Lebanon, Egypt, Iraq, Tunisia and Syria, in addition to a number of LAU students and staff. This rang true for participant Sarah al-Omari, a program officer at Tripoli-based Lebanese Association for Scientific Research, who said the workshop was an opportunity to learn how to deliver health content to the public. “We are currently strategizing what to do with the health department, and we need to be creating content to spread to our community,” she explained. Senior Multimedia Journalism student Mahnaz Maktabi saw the workshop as an opportunity for exposure and building a network of contacts to help her when she finally enters the workforce. Maktabi, who also has a research background, said she was interested in the combination of journalism, science and research, which the workshop helped highlight as a career path. 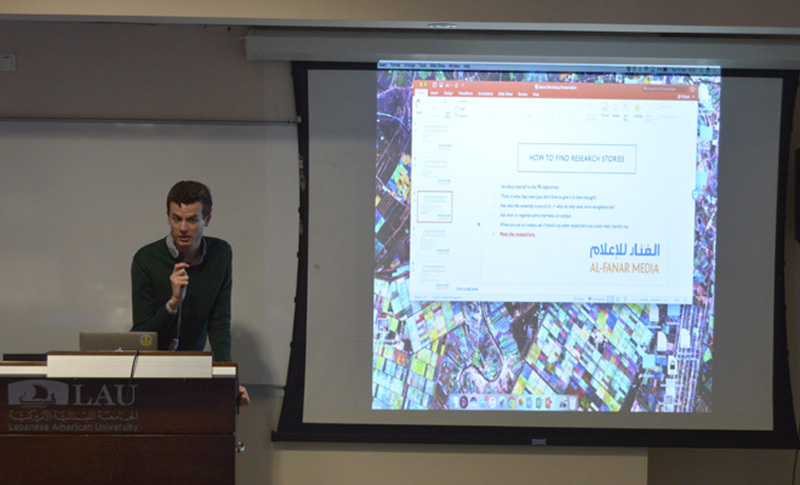 Among the speakers was Al-Fanar senior writer Benjamin Plackett, who gave participants a list of useful tips for interviewing researchers. Attendees also learned about research projects, fellowships and grants during a speech from Seteney Shami, director general of the Arab Council for the Social Sciences. Writing about research and education is more than just content creation. Fadi Maalouf, child and adolescent psychiatrist at the AUB Medical Center, said that journalists have the opportunity to “surface mental-health issues in the Arab world,” though he cautioned against coverage that could stigmatize mental illness. Aside from the learning experience, the workshop also provided LAU students with the opportunity to submit articles or blogs to Al-Fanar for publication.